…under the nearly-full moon to find a cozy little snowy den for myself. I parked at Road 20 around 8:30 pm. I had borrowed a load of warm gear from Frankie: an extra Thermarest, two emergency blankets, a bivy, and an unforgettable pair of down pants. I had never been winter camping in my life, nor had I skied with a heavy pack, and the only people I could consult were Allen & Mike, but I had been raised in a cold, snowy land and grew up camping in remote wilderness. At the very least, Dad felt confident in me. I packed up everything, strapped my skins on, and set off into the night. 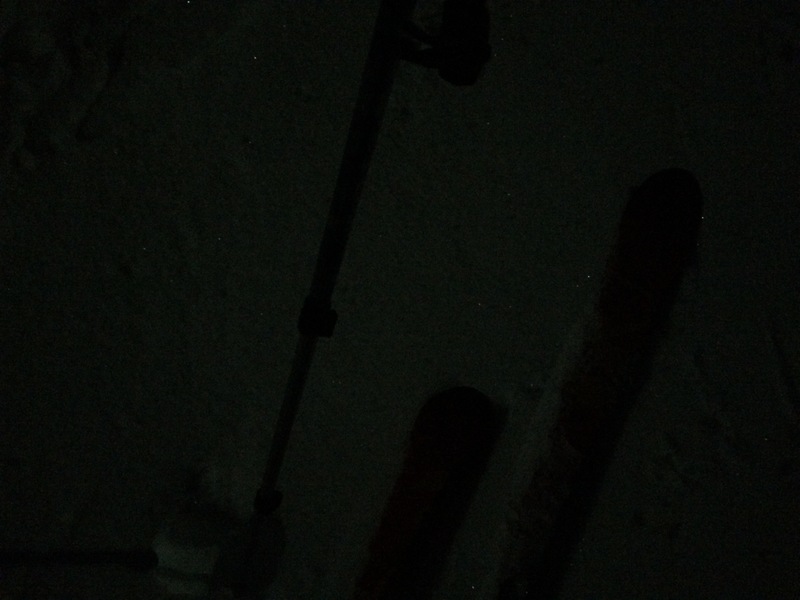 It was so bright out I didn’t need my headlamp, reminiscent of my Mount Shasta summit night with David back in 2012. I was so alone. It was so quiet. Shasta was gleaming in the distance. My cares from the day fell away and I felt deep peace and happiness. Nowhere to go, nothing to do, just develop the rhythm of sashaying skis and poles and breathe. I casually tapped the snow to my right every now and then, testing the softness. It was reliably crusty for a while. I eventually came to an opening in the trees that was slightly tracked out, the snow pillowy and glittering, my pole tip disappearing with my last hopeful tap. I took off my large backpack and strapped on my smaller pack for water and for skin storage once I reached my destination. Skinning up a slope is hard, satisfying, beautiful work. I didn’t quite make my summit goal, as the snow started to get crusty, but I probably climbed for about 30 minutes. I looked over to the moon and noticed how she illuminated the tracks from that day’s skiers. I saw how it was diamond-like and perfect. I felt my labored breathing. I got a little lost on the way down and found myself in some trees on the way to my pack. I thought for a minute about tree wells but sailed through the forest unscathed. I made it to the road, found my deserted pack, and carried the load another 15 minutes to an open meadow near Grouse Gap Shelter. Getting a bivy set up to keep one warm in the snow takes some maneuvering. Before taking off my skis I stamped out flat little bed. Into the bivy I stuffed both sleeping mats, threw in my bag, and piled in one of the blankets. Putting on the down pants was a feeling I’ll never forget: a soft warm cloud around my tired, cold legs. I ate a couple of chunks of smoked salmon Aaron had sent me; I had saved the fishy treat for this day. I scooted in to my little thermal cocoon, zipped up, and that was it: I was alone on a mountain in the snow on my birthday, warm and very sleepy. I slept like one would expect. I was an agitated pupa. I had to head out right when I woke up to get the car back to my friends. I skinned out groggy. About 15 minutes later a dog cruised by me, followed by a young backcountry skier lady. We looked at each other happily and became instant friends, skinning out together back to our cars. Thus began my newfound love for winter camping and a deeper appreciation for backcountry skiing and all the freedom and adventure it provides.